Registering a domain for your website involves providing contact information to your registrar. While you might think that this information stays between you and your registrar, this isn’t the case. By law, your contact information actually gets published to a public WHOIS database. 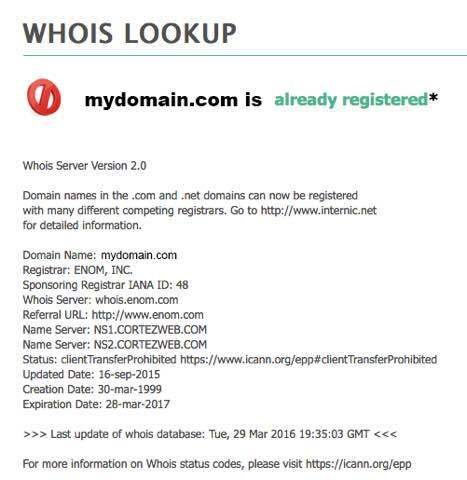 A WHOIS database is a lot like a phone directory. So just like having a listed phone number, having a listed domain registration means your “private” contact information is available to the public. But instead of just being for the folks in your residential area, it’s open to the entire world wide web. So anyone with access to the internet can access that database, find your contact info, and add your records to their lists. Record harvesters can then resell your info as leads to unsolicited marketers and scammers. WHOIS databases are one of spammers’ top sources for finding email addresses. And once your contact info has been added to a marketer’s list, it can stay there for years. At Cortez Web Services, we know your time is valuable. Nobody wants to waste time deleting junk email, and nobody wants the headaches that come with it. Like accidentally trashing important emails. Or worrying about what else has been compromised. ID Protect is a service that masks your contact information with generic name and address details. It also throws off spam attacks by incorporating a hidden email address into your registration, which forwards to your actual email address while keeping it private. Simply add ID Protect to your domain registrations, and your real information is secure from email harvesters and scam artists. Ready to free your inbox? Contact us today to get protected.